Carter Bond is one of the first brands in the world to produce wood-finish acetate frames using natural looking materials that can easily be adjusted, providing a beautiful product that is easy to work with and wear. Please note, no trees were harmed in the making of these frames! Model 9159 SUN is a superb vintage inspired sunglass in our signature wood look finish. Model 9161 follows the trend for deeper frames in more colourful woods. 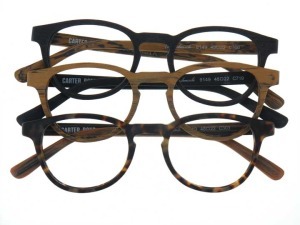 Fabulous model 9149 from Carter Bond is now back in stock!